Uma Bharti, BJP's star campaigner in Uttar Pradesh, today said that she was not a Chief Ministerial candidate of the party in Uttar Pradesh(UP). Bharti, who is contesting from Charkari assembly seat in the state and hails from Madhya Pradesh, said she will be a "guard" in Uttar Pradesh. "I am not a chief ministerial candidate. Sincerely, I am saying I am not in the race for Chief Minister. 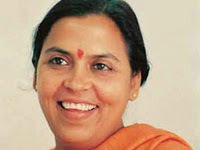 (But) I am in the race for kind of a guard," Uma bharti said. She was replying to a question on whether she was a chief ministerial candidate of BJP in the state. Asked about her campaigning in the state, Bharti, a prominent OBC leader of BJP who has been attacked by Congress leader Rahul Gandhi for being an "outsider", said Uttar Pradesh was like "home" to her. "Uttar Pradesh has been very close to my heart," she said Bharti said BSP was the main political opponent of her party in the state.